The New Testament is chock-full of stunning passages on the nature of Christ. Capable of standing alongside such texts as John 1:1-17 or Colossians 1:15-20, we face the opening lines of the epistle to the Hebrews 1:1-4. While we don’t know who the author of Hebrews was, nor the exact time and setting of the letter, it’s very clear that he had one key purpose in writing to the churches: strengthen, secure, and refocus their faith in the supremacy and sufficiency of Jesus Christ. Engaging in a full-blown exegesis of this text is far beyond me–at least in a short post–but I did want to highlight some of the key points of astonishingly comprehensive-yet-condensed Christology. Here are, then, seven things the author of Hebrews says about Christ. Son. The first thing that the author notes is Jesus is “his Son.” Now, in what exact sense Christ is the “Son” here will be filled out in a couple of the other qualities which he ascribes to him. But whatever else he says, the title under which he possesses all these other categories and accomplishes all of his works is as the Son. Revealer. Secondly, the Son is the ultimate capstone of God’s self-revelation. In former times, God spoke in various ways, through prophets, through poets, historians, and the other authors of Scripture, inspired by God. But now God speaks–God communicates God’s will, God’s works, and God’s wisdom–in the person of the Son. He is the culmination–though, not the denial!–of all that God has spoken before. Heir of All Things. It is this Son who has been appointed the “heir of all things.” What could this mean? Well, the Son is Son, in one sense, according to the flesh. As the Psalms testify (2, 110), he is the Royal Son of David, heir to the throne of Israel, the blessings of the covenant, and even more, the true Son of Adam, heir to the kingdom of the whole world. Creator. Next, this Son who has been appointed heir of all things according to his humanity seems to have a deeper claim on the world: he is the agent through whom God “created the world.” Note the echoes here of God’s Wisdom (Proverbs 8). With that reference in mind, we see the author of Hebrews says something fascinating. Just like the John (1:1-3) and Paul (Col. 1), he operates with the clear, Jewish delineation between the Creator and the creation, but also just like them, he has the Son on the Creator side of the line. The logic is clear: if the world was made through him, what is he not? Any other thing in the world. No, he is their Creator. Radiance of Glory and Imprint. The Son, we are told, is the radiance, the shining, the “refulgence”, of the glory of God. This is part of his role as Revealer. Of course, in Scripture, God’s glory and God’s person are irrefragably bound up together as a the sun is with the rays of light pouring forth from it. The Son reveals God’s glory precisely because he is the “exact imprint”, the one who has the very “form” and shares the “nature” of God (Phil. 2). Sustainer. In case you’re still a bit skeptical, we also learn that the Son is the one who “upholds the universe.” How? By “the word of his power.” The Son, then, is not only the one who brings the world into existence, he sustains it in existence at every moment. He is the source of its coherence, integrity, and continued being (again, cf. Col. 1:15-16). Hebrews has a Christologically-focused doctrine of providence. Purifier. Beyond the work of creation, providence, though, stands that of salvation. This condensed Christology turns out to be short-hand account of the entire economy of redemption. The Son is, in a way that will be filled out at length in the rest of the letter, the one who “makes purification for sins” for his brothers and sisters. He does this both through what he is (the true Priest and Mediator), but also in his work, presenting a better sacrifice to remove the stain of sins, as well as sealing a better covenant in his blood. All of this is confirmed in his being “seated at the right hand of Majesty on high” having completed his work once and for all. All of these titles and works could be expounded for pages, filled out with multiple Scripture references, and derive multiple spiritual applications from each. For now, though, I simply want to note just how high a view of Christ we are given in these verses. Jesus, the Son, is the agent of revelation, creation, providence, and salvation–all divine works. Alongside key passages in John, Paul, and Revelation, it’s quite easy to see how the Fathers at Nicaea and Chalcedon came to the conclusions about the person of Christ that they did. It wasn’t a matter of Greek, philosophic, metaphysicalisation (if that’s even a word) of the Gospel. Rather, it was simply an effort to expound and explain the already-dense, theologically-thick testimony to the glory of Christ given in the pages of the New Testament centuries earlier. 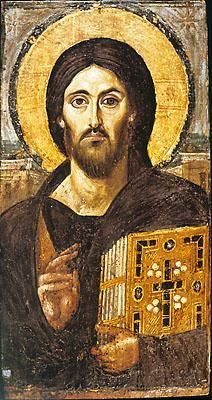 Our Christ Jesus as we see him in scripture is truly amazing, awe inspiring at every turn, no less so in Hebrews. Your synopsis is excellent in every way except one: Philippians 2 doesn’t quite say that Christ ‘shares the “nature” of God’ but is in the “morphe” of God (ἐν μορφῇ θεοῦ). This is where I think the “Fathers at Nicaea and Chalcedon” did get into the “Greek, philosophic, metaphysicalisation” while theologizing about Christ–not to mention that the whole life of Christ is turned into a rather abstract, barely historical oversimplification of the Gospel, and hence quite Hellenistic. I wonder how the Son upheld the universe during the incarnation. Was that the divine aspect of himself that did that?